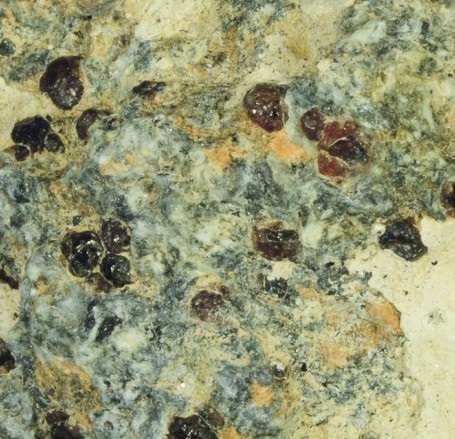 The fragment of the metamorphic rock eclogite in which the garnet that encased the ferric-iron-rich majorite sample was found in Northern China. Credit: Yingwei Fei. Recovered minerals that originated in the deep mantle can give scientists a rare glimpse into the dynamic processes occurring deep inside of the Earth and into the history of the planet's mantle layer. A team led by Yingwei Fei, a Carnegie experimental petrologist, and Cheng Xu, a field geologist from Peking University, has discovered that a rare sample of the mineral majorite originated at least 235 miles below Earth's surface. Their findings are published by Science Advances. Majorite is a type of garnet formed only at depths greater than 100 miles. Fascinatingly, the majorite sample Fei's team found in Northern China was encased inside a regular garnet—like mineralogical nesting dolls. It was brought to surface as an eclogite xenolith in the North China Craton, one of the oldest cratonic blocks in the world. What's more, the majorite was rich in ferric iron, an oxidized form of iron, which is highly unusual for the mineral. All of these uncommon factors prompted the team to investigate the majorite's origins. It is extremely unusual that a high-pressure majorite could survive transportation from such a depth. Adding to the strange circumstances is the fact that it was later encased by a garnet that formed at a much shallower depth of about 125 miles (200 kilometers). The nesting-doll sample's existence required two separate geological events to explain, and these events created a time capsule that the researchers could use to better understand the Earth's deep history. "This two-stage formation process offers us important clues about the mantle's evolutionary stage at the time when the majorite was first formed," Fei explained. The sample's location and depth of origin indicate that it is a relic from the end of an era of supercontinent assembly that took place about 1.8 billion years ago. Called Columbia, the supercontinent's formation built mountain ranges that persist today. "More research is needed to understand how the majorite became so oxidized, or rich in ferric iron, and what this information can tell us about mantle chemistry. We are going back to the site this summer to dig deeper trenches and hope to find fresh rocks that contain more clues to the deep mantle," Fei added.